The Genealogy Center of the Allen County Public Library in Fort Wayne will hold a free class, "Researching Church Records," on Saturday, May 25 at 10 am. The class is a basic overview of the steps you need to take to find church records, and will feature examples of records from many different denominations, as well as offer strategies for research and interpretation. This class is part of the "Family History Fundamentals" series. For more information, or to register for this free event, please call (260) 421-1225 or e-mail Genealogy@ACPL.Info. FamilySearch has updated the Indiana marriage index 1811-1959 that is in progress. Index entries have been added for Shelby County, Starke County and Switzerland County; the searchable index now covers 57 of Indiana's 92 counties. The Genealogical Society of Marion County will meet on Saturday, May 11 from 1 to 3 pm at the Eagle Branch of the Indianapolis-Marion County Public Library (3325 Lowry Rd., Indianapolis - east of Georgetown Rd., at the corner of 34th St.). Terry Prall will present a program, "San Juan Hill, A Mayflower Connection, a Ship Lost at Sea and other bits of family lore," which will explore family stories and tidbits and how to find out if they were truth, fabrication or a combination of the two. Admission is free and all are welcome. Matt Eidem, archivist for the Indiana Room of the New Albany-Floyd County Public Library, will discuss the library's collection and his role in preserving historically valuable and unique documents at the Thursday, May 2 meeting of the Southern Indiana Genealogical Society. Meeting time is 7 pm in the Strassweg Auditorium of the New Albany-Floyd County Library (180 W. Spring St., New Albany, Indiana). For more information about the Southern Indiana Genealogical Society, please visit http://www.rootsweb.ancestry.com/~insigs/index.html. I am looking for a death documentation for Elizabeth (MOORE)REES who died I think in 1853. I know in 1850 she was living with her daughter Kesiah REES McCLURE. Kesiah is buried in Old Hopewell Cemetery, in Ripley County and I believe Elizabeth is also buried there. Really I am looking for info on Elizabeth's parents. Also, what are the odds there would be an obituary at this early date? I am interested in finding out information about Richard E. CARVER. According to census information he was born March 1872. He later married Anna Mae Long DuPLAN in about 1899 and lived in York Township, Switzerland Co. Indiana. His children were Virginia CARVER, Helen CARVER (who later married Everett SCUDDER..these are my Grandad Harold SCUDDER'S parents), Mable CARVER, Albert CARVER, and Robert CARVER. Even though I know these things about him, I still do not know who his parents were. I would love to be able to find this out. LaPorte County Recorder Barbara Dean will speak at the LaPorte County, Indiana Genealogical Society's meeting on Tuesday, May 14 at 7 pm. The county recorder is responsible for preserving many important historical records, especially those involving property ownership. According to the official website, "The county recorder's function is to maintain permanent public records involving a wide variety of instruments. These documents detail transactions involving real estate, mining, personal property, mortgages, liens, leases, subdivision plats, military discharges, personal bonds, etc." Barbara Dean will talk about records preservation, how it affects genealogists, and what she is doing about it. The meeting, which will be held at the Swanson Center for Older Adults, is free and open to the public. Looking for information on a Laura PAUSEL in Pleasant Mills Cemetery, Adams County, from 1859-1860. Seeking mutual ancestors of JABEZ and Mary Rohrer SHANK, both b.Ohio 1854 & 1856. Two children, Elmer O. & Pearl, b 1883; In Tipton Cass Indiana in 1900 census. Jabez died Onward, IN 1931. Jabez, s/o Abraham and Wilhelmina Toms Shank. Have lovely young picture of Pearl to share. I'm trying to trace a long lost relative who was living in Decatur County, Indiana in the Lawrenceburg Township in 1910. His name was Morris H. DEVORE and his wife was Charlotte (Lottie) DEVORE. The last record I have of them was the 1910 census which showed them living in the Odd Fellows Home in Lawrenceburg, Indiana. I believe but have no documentation that Morris died shortly after 1910. I am trying to find transcripts for a trial that occurred in 1880/81 in which my great great grandfather was accused and found innocent of Bastardy. I contacted the Monroe County Clerks office and the lady there couldn't find anything that far back and suggested the MonroeCounty.org site, which I also looked at but their court records are for 1818 - 1875. Grandpa was also in jail for that trial year so I am trying to get record of that also but have not heard back from the agency I wrote to. The records are no longer at the jail for that time period. His name is Charles Harry CATES b/1859 Bloomington d/ 1906 Bloomfield IN buried Rose Hill Cemetery Married Mary Ann BOCKMAN 1880 in Bloomington and married Catherine LOFTUS in 1890 in Bloomington. His parents were Calvin CATES(1830 - 1874) and Nancy TODD (1836 - 1894). Both parents died in Bloomington. Any information on Calvin would be really great too! His military papers said he was born in TN but that is thus far a dead end. The last name was frequently spelled Kates, also. Looking for information on Peter Nelson JACKSON b: 1845 Syracus, Onondaga, N.Y. This is what I have found so far. 1850 Fed Census at Boon, Porter, Ind. 1866 mustered out at Valparaiso, Porter, Ind. 1866 During this time a daughter named Irene JACKSON was born. Sometime after the birth and before 1870 Mary Mott JACKSON died. Supposedly Amanda Almira Alyea took care of Irene for Peter Nelson Jackson. Amanda Alyea became Nelson Jackson's second wife (legal?) before 1870. Hope to find a marriage record. Sometime in 1871 Oliver Jackson was born. 1870 census for Nelson Jackson. 1880 I believe the Jackson's were in Adair County Iowa. From 1880-1890 on, the Jackson's resided at Winterset, Iowa. Perhaps there might be other information pertaining to the Jackson's. Any information that can be found will be appreciated. Editor's Note: Porter County, Indiana records have been thoroughly check. This is being posted hoping that some one out there might know this family and have more information. 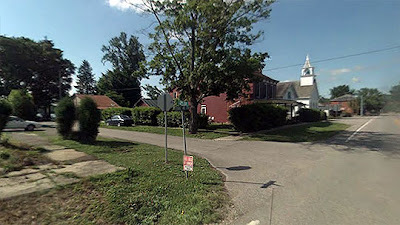 Looking for information on Isaac Newton ABBOTT b. Feb 1869 his birthplace may have been either Seymour, IN or Scott Co,. IN We have been able to locate only one record for him before his marriage in 1894 in Montana. 1870 census show age 1, living with the family of Wm. H and Margaret JONES. The census was taken in Vienna, Scott, IN. A few listings apart on the same census were a family of John and Mary ABBOTT. We have speculated that he may have been living with relatives because his mother could not care for him but have no facts to support that. I have not been able to locate him on subsequent censuses with either of these families. Were any orphanages in the 1870s and 1880s in Indiana? The Valparaiso branch of the Porter County Public Library will hold a free workshop, "Using Genealogical Forms", on Saturday, May 4 from 10 am to noon. Marlene Petty Polster, who works at the library's Genealogy Department and is also the Lake County Genealogist, will show how to use genealogical forms and how they can help you in your research. The workshop is free and Indiana librarians can earn 2 LEU credits for attending. To register, or for more information, please contact the library's Genealogy Department - phone (219) 462-0524 ext. 5. The IGS table set up and ready for the first session break. 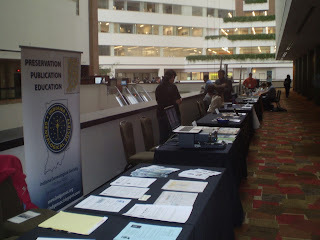 The Indiana Genealogical Society attended the 2013 Midwest Archives Conference, held at the Hyatt Regency Hotel in Indianapolis on April 18 and 19. IGS members Rachel Popma and Ron Darrah staffed a table and represented the genealogical community to the 300+ librarians and archivists attending the event. Numerous Hoosiers were among the panelists and presenters, including: Jason B. Jackson, Indiana University; Tibaut Housanme, Indianapolis Marion County Public Library; Steve Haller, Indiana Historical Society; Sally Childs-Helton, Butler University; Liz Haeuptle, Elkhart County Historical Museum; Steve McShane, Indiana University-Northwest; Branda Burke, IUPUI; Alison Stankrauff, Indiana University-South Bend; Dale Ogden, Indiana State Museum; Steve Towne, IUPUI, and Brent Abercrombie, Indiana State Library. A number of Indiana librarians and archivists were also attendees, including Indiana State Archivist Jim Corridan, and Rachel and Ron talked to many of them as well as other attendees. Most conference attendees were well aware of the strong genealogy interest of their customers and IGS tried to emphasize that link. IGS was the only genealogical vendor there, and also the only non-commercial vendor. The "Miami Indian Heritage Days" season will kick off on Saturday, May 4 at the Chief Richardville House (5705 Bluffton Road) in Fort Wayne. The Chief Richardville House was named a National Historic Landmark this past year. Sponsored by the History Center, Miami Indian Heritage Days programs are held from 1-4 pm on the first Saturday of the month from May through November. The programs feature local artists, performers and representatives from the Miami Indians and other Native American groups demonstrating aspects of their lasting heritage for the public to enjoy. Admission for each Saturday event is $7 for adults and $5 for students and seniors. History Center members and children ages 5 and under are free. Admission also includes the opportunity to visit the Chief Richardville House. Saturday, May 4 - "Medicine Woman Drum" will be featured beginning at 1 pm. The group’s performances demonstrate the importance of drumming, singing and dancing in Miami society. Saturday, June 1 - Sue Lester will display traditional Miami clothing research and fabrication. Saturday, July 6 - Andrew Knight, a new presenter at Miami Indian Heritage Days, will feature Miami weaponry. Saturday, August 3 - Katrina Mitten will feature Miami bead work. Saturday, September 7 - Dani Tippman presents "Miami Harvest," a program about edible and usable plants and materials. Saturday, October 5 - M.I.A.M.I. (Miami Indian Alliance of Miami Indians) will present programs about wikiami building and cattail matting. November 2-3 is Traders Days. Vendors, craftsmen and artists sell quality Native American items including fine art, gourd work, beading, carved wood pieces, corn husk dolls, Christmas ornaments, Native American shields, jewelry, clothing, feather work, homemade baked goods and more. Traders Days events are free to the public and will be open on Saturday from 10 am to 5 pm and on Sunday from noon to 4 pm. For more information, please contact the History Center - phone (260) 426-2882; www.fwhistorycenter.com. 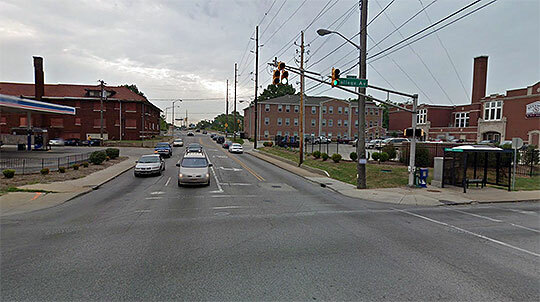 The Indiana Genealogical Society's 2013 Conference page has added information about places to park in downtown Bloomington, as well as restaurants that are within easy walking distance of the conference site. The conference will be held on Saturday, April 27 at the Monroe County Public Library in Bloomington, which is adjacent to the Indiana University campus. The Indiana Genealogical Society now has 1,045 databases in the Members Only area. Each of Indiana's 92 counties has at least 4 databases. For genealogists and those who just seem to acquire all the family records, organizing the information can be overwhelming! Bruce Buzbee of RootsMagic will be at the Allen County Public Library in Fort Wayne on Monday, April 22, to show how RootsMagic software may be the perfect solution. The event will be held in Meeting Room C of the Main Library (900 Library Plaza) from 6-8 pm. Whether you're a beginner or long-time researcher, RootsMagic can help you organize your family tree. Join RootsMagic's Bruce Buzbee as he explains the basics of how it can work for you. Once you learn about RootsMagic's basics, Bruce Buzbee will demonstrate new features sure to dazzle and amaze you. Don't miss this unique opportunity! To register for this free event, call (260) 421-1225 or email Genealogy@ACPL.Info. Shelley Cardiel (cardiels@comcast.net) has found a photo of a Lafayette girl dated January 1889 and seeks to find a descendant so the photo can be returned to its rightful place. If you recognize this family, please contact her. 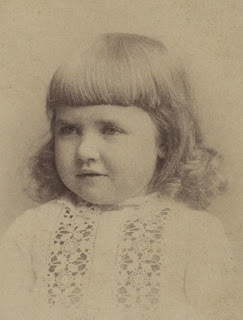 The photo is of Helen Louise EMERSON, age 4 1/2, taken at the Phillips studio in Lafayette, Indiana. Her limited research has found that Helen Emerson was born in 1885 in Indiana to Harry Waldo Emerson (born 1855) and Fanny Louise ANDREWS (born 1860). Helen had siblings Thomas W. Emerson and Harry A. Emerson who were born in 1886 and 1888, respectively. The Indiana Genealogical Society now has 1,044 databases in the Members Only area. Each of Indiana's 92 counties has at least 4 databases. The Indiana Genealogical Society now has 1,043 databases in the Members Only area. Each of Indiana's 92 counties has at least 4 databases. NOTE: The Indiana Soldiers' and Sailors' Orphans' Home (later called the Indiana Soldiers' and Sailors' Children's Home) was founded in 1865 specifically for the children of Civil War veterans, but the eligibility was later expanded to include the children of any veteran. The Indiana Genealogical Society now has 1,042 databases in the Members Only area. Each of Indiana's 92 counties has at least 4 databases. The Indiana Genealogical Society now has 1,039 databases in the Members Only area. Each of Indiana's 92 counties has at least 4 databases. The Indiana Genealogical Society now has 1,037 databases in the Members Only area. Each of Indiana's 92 counties has at least 4 databases. The Indiana Genealogical Society now has 1,035 databases in the Members Only area. Each of Indiana's 92 counties has at least 4 databases. The Indiana Genealogical Society now has 1,033 databases in the Members Only area. Each of Indiana's 92 counties has at least 4 databases. The Genealogical Society of Marion County will meet on Saturday, April 13 from 1 to 3 pm at the Eagle Branch of the Indianapolis-Marion County Public Library (3325 Lowry Rd., Indianapolis IN 46222). Ron Darrah will present a session, "School Days: A Great Records Resource." Nearly all Americans attended some kind of school, and school attendance created many kinds of records. This session will identify the numerous types of records available, show what you can learn from them, and where you can go to locate and use all of these valuable resources. Both beginners and advanced researchers can profit from this information. The session is free and open to the public. No registration is required. For Terre Haute, Indiana, just as for much of the Midwest, the events of Easter Sunday, March 23, 1913 were just the beginning of what would prove to be a disastrous week. In just 2 1/2 minutes, a tornado plowed through the city that claimed 21 lives, injured 200, and destroyed 300 homes. 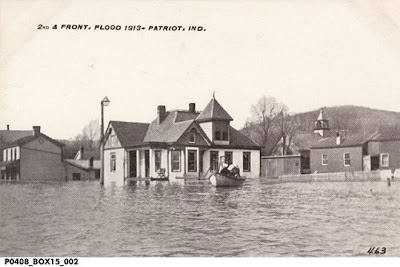 Along with the twister came a series of mighty storms that flooded Indiana cities like Brookville, Fort Wayne, Frankfort, Lafayette, Peru, Terre Haute, and Washington. A view of the 1913 flooding at 2nd Street and Front Street in Patriot, Switzerland County, Indiana vs. how it appears in 2013. The town of Brookville in Franklin County, which sits at the junction of the east and west forks of the White Water River, saw extensive flooding that claimed the lives of 16 people and destroyed 5 wagon bridges, a railway bridge, a railway station, and a paper mill. The rains filled the river in Brookville and drove it up to height of the bridges crossing it, allowing them to temporarily act as dams and slow the river’s advance. When the bridges began to give way under the immense pressure, a tidal wave of flood water was released which traveled over 11 miles downstream. By March 25, after two days of rain, 2,000 homes in Fort Wayne had been flooded following the failure of the four levees which held back the St. Joseph River. Both the Maumee and the St. Joseph River crested at record heights, with the Maumee rising over 11 feet above flood heights. Later that night another levee broke by Morris Street, filling the city with more water and swept away even more homes. The water, light, and power plants were all flooded, leaving the city in darkness and with no sanitary drinking water for days. In Fort Wayne the floods damaged 5,500 homes and businesses, left nearly a third of the city homeless, and claimed the lives of six people. 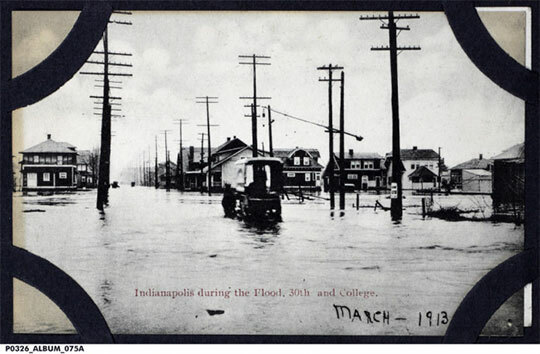 The corner of 30th Street and College Street in Indianapolis during the 1913 flood vs. how it appears in 2013. Indiana saw some of the worst destruction during the week of storms, although the state’s residents were spared the wholesale destruction wrought by tornadoes in Nebraska and Iowa and the mayhem in Dayton, Ohio, where flood waters reached 20 feet deep in the city streets. In total about 90 people died in Indiana during the flooding, but the number of homeless was in the thousands. The destruction of railroad tracks and bridges crippled the state for weeks, and the economy would take years to fully recover. Thanks so much to Meredith Thompson for letting us share a piece of this historical project on the Indiana Genealogical Society Blog. We’re humbled by the interest in this project, and we really hope you enjoyed this snippet of history! We’d also like to thank some of the great archives and archivists who have done so much to work to help preserve the amazing history of the 1913 flood, including the Dayton Metro Library and historian Trudy Bell. The amount of history compiled at these two websites is truly amazing. Lastly, thanks to Jason from InsuranceTown.com, who lent us some of the resources we used to help prepare content for the web and publish our blog, and inspired our Mapping History Contest. Don’t forget to check out HistoricNaturalDisasters.com for more images, and for information on our Mapping History Contest – help us figure out the locations pictured in historic photos from 1913 and you could win $100! Harold Henderson's blog post explains more about what is included in this guide and how you can become more efficient in your research at the Genealogy Center. The Indiana Genealogical Society has added the March 2013 issue of Indiana Genealogist, the quarterly publication for our members, to the Members Only area. IGS members can login to the IGS Records section to download their copy. There are also brief items from every region of the state.